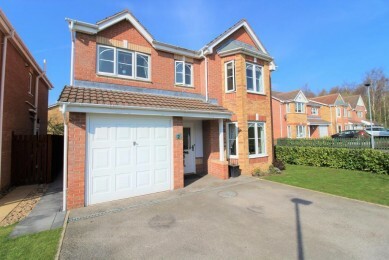 **STUNNING FAMILY HOME** Gates estates are pleased to present to the market this four bedroom detached property located in the sought after area of Tankersley. Having accommodation briefly comprising; living room, kitchen/diner, cloakroom, 4 double bedrooms, 3 bathrooms and utility room. A welcoming space which provides access to the first floor, living room, cloakroom and kitchen/diner. A small cloakroom comprising of low flush WC, wash basin, tiled flooring and gas central heating radiator. This well presented room has carpeted flooring, 2 radiators and a front facing double glazed bay window. There is a gas feature fireplace and access through double sliding doors to the dining area. The kitchen diner has the advantage of taking some space from the old integral garage making this a very large and spacious kitchen/diner. It has a range of high gloss wall and base units with beautiful Rouille zenith work surfaces which incorporates a one and half sink and drainer. Integrated appliances include; Fridge freezer, slimline dishwasher, double electric oven, 5 burner gas hob, wine fridge, pop up plug sockets and large larder cupboard. An island which includes storage and a small breakfast bar also available. There are two rear facing double glazed windows looking out to the garden and access to the garden via UPVC double glazed door and double French doors in the dining area. The flooring is tiled and even boasts underfloor heating. Access to the loft, four bedrooms, storage cupboard and house bathroom. A front facing bedroom which has a radiator and double glazed, bay window. There is carpeted flooring and walls are painted white with a feature wall which has been wallpapered. Integrated wardrobes are located as you enter the room which help save on space. There is also access to its very own En-suite with a shower cubicle, WC and wash basin. Located to the rear of the property next to the master, this room has a large double glazed window overlooking the garden, double radiator and carpeted flooring. Having a three piece suite in white comprising, corner bath, low flush wc and pedestal wash basin. There is a radiator and rear facing double glazed opaque window. A good sized double bedroom with double glazed windows overlooking the rear garden. The flooring is carpeted and provides access to the "jack & Jill" style En-suite which is shared with Bedroom Four. The En-suite comprises of WC, wash basin and shower cubicle. A spacious room to the front of the property. The flooring is carpeted and there is a double glazed window overlooking the front garden. A grassed lawn with concrete, paved driveway allowing 2 vehicles to park including access to the rear garden via lockable gate. The front part of the garage makes a handy utility room with access into the kitchen/diner. To the rear is an enclosed garden area and separate lawn and patio area. The garden isn"t overlooked and is excellent for entertaining. It includes a bar area and access to the property.